Nigeria: Will The Real PDP Leader Please Stand Up? 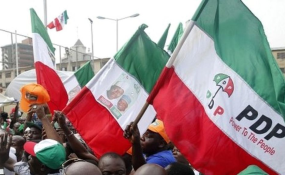 The leadership of the Peoples Democratic Party (PDP) yesterday approved the fusion of the Reformed All Progressives Congress (R-APC) into the party ahead of the 2019 general elections. This decision was taken at the 80th National Executive Committee, NEC, meeting of the party which held on Monday. Another decision taken by NEC was the expulsion of prominent members of the Ogun State chapter of the party including the lawmaker representing Ogun East Senatorial District, Buruji Kashamu. Also expelled were the trio of Semiu Sodipo, Segun Seriki and Dayo Adebayo. Briefing journalists at the end of the meeting, party's spokesman, Kola Ologbondiyan also noted that the NEC approved the setting up of a committee on name change, adding that the decision to head to court over the Ekiti governorship election received the blessing of party leaders across board. "We took disciplinary action against members hobnobbing with the ruling party. We shall not accept any untoward behavior from members anymore. As a result, NEC approved the expulsion of Senator Buruji Kashamu, Semiu Sodipo, Segun Seriki and Dayo Adebayo, all members of the Ogun state chapter of the party, until their expulsion. "The party has also constituted a committee on harmonization on the possibility of a change of name," he added.